You Are Here: Creating a New Approach to Civic Participation in the World’s Park is an exhibition that highlights the people, process and proposals that are emerging for Flushing Meadows Corona Park from of an intense design collaboration between a group of neighbors supported by the park’s administrators and a team of fellows working with the Design Trust for Public Space and the Queens Museum. You Are Here culminates the first phase of The World’s Park: Reconnecting a Regional Park with Its Neighbors, a community engagement partnership between the New York City Parks Department, the Queens Museum, and the Design Trust for Public Space, focused on creatively empowering the community of neighbors that are passionate about the future of Flushing Meadows Corona Park. The exhibition highlights creative opportunities for the Park’s future that were explored by the Community Advisors in response to the ‘connectivity’ challenges facing the park, including issues surrounding access, wayfinding, park history, cultural resources, and programming for children with special needs. 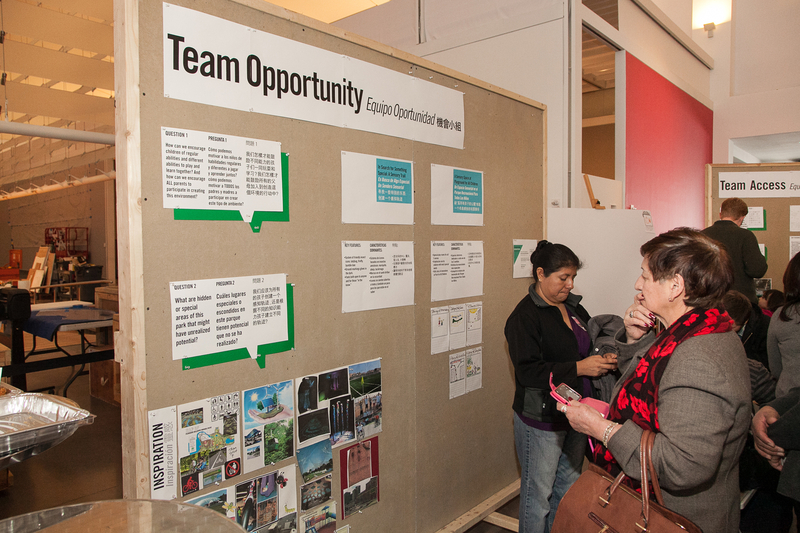 Alongside the community-driven proposals addressing these challenges, the exhibition also illuminates the curriculum for the series of learning events that have been bringing together the Community Advisors and parks administrators since December 2014.